The UN peacekeeping mission in the Democratic Republic of Congo has been given a week to fly hundreds of South Sudanese fighters out of the country. The men are loyal to South Sudan's sacked Vice-President Riek Machar and crossed into the country with him in August following intense violence in the South Sudan's capital, Juba. The 750 men have been disarmed and cared for by the UN mission. But Congolese officials say they are now a security risk. They are being housed in UN camps in the volatile east of DR Congo, near the city of Goma in North Kivu province. The demand from DR Congo's government that the men be removed comes after a protest in Goma last Friday. The South Sudanese fighters have not been in any reported trouble since their arrival. But residents say they fear a repeat of the fallout of the 1994 genocide in Rwanda when perpetrators of the mass killings set up base in eastern DR Congo. "In April 1994, the population of North Kivu lived up to their legendary hospitality by welcoming Rwandan refugees," Jean Paul Lumbu Lumbu, an activist in Goma, said. "Unfortunately, the same refugees turned into those FDLR rebels and became executioners of North Kivu residents. 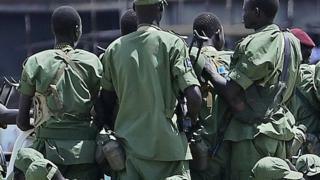 That is why we deeply fear the gathering of South Sudanese rebels into camps." Will the FDLR ever leave Congo? Correspondents say locals in Goma also fear the government of South Sudan, under President Salva Kiir, may exercise a "right of pursuit" across the border, exposing them to fresh conflict. The UN has confirmed that it has been contacted about the issue but has not commented on whether it will acting on the request to remove them by 10 October. Mr Machar, who had joined a unity government in April, was also aided by the UN in DR Congo and is now in residence in Sudan's capital, Khartoum.